This super-exposed arete goes to a true cool summit (a rare thing for a Lover's Leap route). 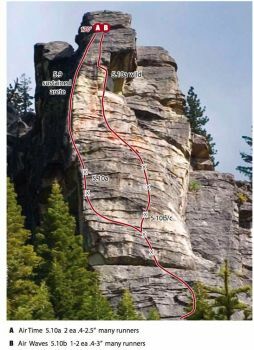 This route uses mostly gear with some bolts. In can be climbed in a 190-super stretcher pitch. Or it can be cut into smaller lenghts to cut down on rope drag. If you want to lead a 190' pitche, you need to use TONS of runners to reduce rope drag. Which SuperTopo guidebooks include a topo for Airwaves? Route B in the photo.